A church can be measured simply based on how it views worship. It’s more than music and a message. Worship is at the heart of the Christian life. On Sunday mornings we gather for worship as people with different stories and life experiences, but our worship of Jesus unites us together as one family. We invite you to come without any pretense and know that you don't need to have it all together. So whether you're new to the area, or maybe it's been awhile and you'd like to get back in church again, you're welcome at Rockwall Pres. Come follow Jesus with us. We'd love to have you. Worship is recognizing and trusting in the presence, goodness, and glory of God in all circumstances and situations. Being devoted to worship is recognizing that our lives are all about Jesus and seeking him in all things. Our services are a special time of worship, because we all gather to honor Jesus for his goodness, sacrifice, and love for us. Here's the invitation of worship: Jesus wants you to know him, and love him, because he is the most precious gift you could ever receive. When we gather to worship we believe that it's Christ who has ultimately invited us. We aren't here because we decided to show up – we're ultimately here because Jesus has interrupted our story and invited us into his Story. Through singing, confession, prayer, preaching, and the Lord's Supper we draw near to Jesus because he first drew near to us. We are sent by Jesus. As disciples we don't exist for ourselves, we exist to bring the gospel to the world, so that all people might know him. Jesus calls you to a life of profound purpose, because his mission is global in scope and otherworldly in power. Too often we settle to live for so little, and we need to be reminded that in Christ we're meant to the change the world. Each service we pray together as one church family for the needs of our world, community, and church. We love kids at Rockwall Pres and take their faith and safety seriously. All adult volunteers have received background checks and have completed the Child Protection Training provided by the church. At Rockwall Pres we create a safe and loving atmosphere for our little ones. Our infant nursery provides a clean, safe environment for your little ones. It's located at the back of the sanctuary for easy access. Our toddler nursery is separate from our infant nursery to give our toddlers plenty of space to run and play. Our toddler nursery worships with your kids by singing songs and participating in activities that teach them about Jesus. We believe worshiping as a family is vital to our children growing up to value their faith and love Christ's people. We value having our children ages 4 and up in the service with us. 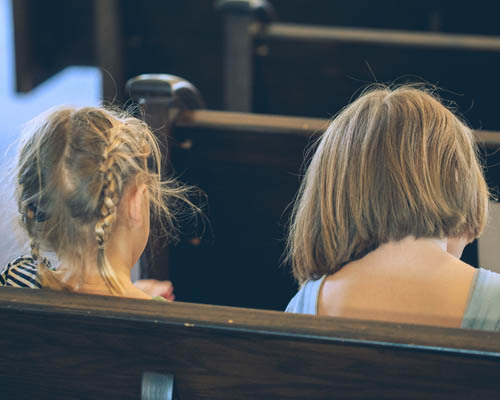 We believe worshiping as a family is the best way for them to learn about the faith and know that they are an important and valued part of Christ's body. Our lessons focus on one question each week that helps us learn more about the God and his word. Our children worship with us because we want them to grow up knowing they're a part of the church. Every Sunday, we take time in our service to speak to them directly in our Children's Lesson for children ages 4–9. Learning to be a disciple begins at home. We want to help. We believe the best place for learning how to follow Jesus is at home. We want our children to be disciples, which is why we try to help parents lead their families well. We know it's not always easy, but it's worth it. Every Sunday in the Worship Guide we provide five questions from the sermon passage for the upcoming week. You might go through one question a day as you drive to school, eat breakfast, or at bedtime prayers. We know that having children in the worship service can be a challenge for parents. This class is a short and helpful survey of how you can do little things to help your child engage the worship service. What does it look like to be a part of Rockwall Pres? Here are a few steps you can take to start getting connected with others. Our Intro Class is offered to those wanting to learn more about Rockwall Pres and who we are. Community Groups are the foundation for living life together at Rockwall Pres. Let's find you a group. Our classes focus on understanding how the gospel effects every aspect of our lives. Check out of what we’ve been up to.